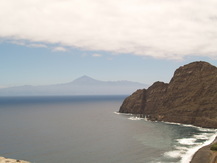 Tenerife used to be three islands in the late Miocene: Roque del Conde (11.6-3.5 Ma), Teno (6.7-4.5 Ma), and Anaga (6.5-3.6 Ma) that got secondarily connected by successive volcanic activity during the late Miocene-Pliocene until Tenerife got its current shape ca. 2 Ma. 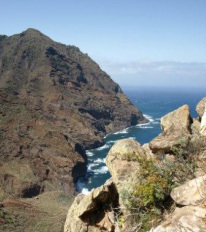 Using a callibrated phylogeny and morphometric analyses we aim to understand the diversification process of the two groups of species of Micromeria present in Tenerife: the species restricted to the palaeo-islands of Anaga and Teno, and the species inhabiting the central, younger part of the island. Read more about this in our 2014 paper. More recently, we developed a set of 16 microsatellite markers to study how the geological history of Tenerife shaped the genetic structure of these species. Read more about this in our 2016 paper here. The Canary archipelago is composed of seven islands located 100 km off the coast of Morocco in the Atlantic Ocean. These islands are older in the east (Lanzarote and Fuerteventura, 15-20 Ma) and younger towards the west (El Hierro, 1 Ma). Using phylogenetic inference we aim to determine the patterns of diversification and inter-island colonization of Micromeria in the Canary Islands. Read more about this in our 2015 paper. More recently, we assessed the influence that inter-island colonization, hybridization and gene-flow played in Micromeria diversification using microsatellites and a RAD sequencing approach we developed. A revision of the species of Micromeria present in the Canary Islands and Madeira archipelagos is needed in order to reconcile the taxonomy of these species with new molecular evidence available. Two papers were published describing new taxa and proposing the combination of several names. Available here and here. 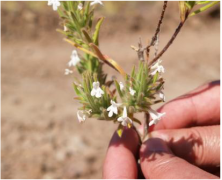 Also, we proposed the conservation of the names Micromeria varia and M. hyssopifolia (available for download here). Unfortunately, this proposal was turned down so these taxa had to be renamed.